A man walks through what is left of a neighborhood in Washington, Illinois, a day after a tornado ripped through the central Illinois town in 2013. At about 11:15 p.m. May 10, tornado sirens blared in Nashville, Arkansas, a town of a little more than 4,500 people in the southwestern part of the state. They came amid the most severe tornado outbreak thus far this year; Nashville’s warning was one of scores issued by the National Weather Service around the South and the Great Plains that week. On social media, there was evidence of a certain nonchalance about the siren’s howl. “Tornado siren is going off in Nashville. Let’s all go outside and look shall we,” wrote Twitter user Sam Dean. The sirens wailed for so long the battery drained, but they gave just five minutes’ notice of what was to come. The storm passed; the sirens eventually quieted. But two people were dead, killed while shielding their infant daughter inside a mobile home being pulled apart by winds of up to 125 mph. Several others were injured, and homes were leveled. It was the first time in 30 years that a tornado had struck the rural Arkansas town. But they’d heard the sirens before. The National Weather Service (NWS) has issued at least 20 other tornado warnings for the Nashville area in the past three decades,1 but only this recent one delivered on the threat. This is typical. By nearly every measure, weather forecasting has improved dramatically over the past 30 years, protecting life and property in the process. But tornado warnings do not belong in that category. Nearly three out of four tornado warnings issued by the federal agency today are false alarms, according to internal grading data provided by the agency, a measure that has seen virtually no improvement over the past 20 years. It’s a confounding and complicated issue for the agency, which admits that crying wolf 75 percent of the time is by no means an acceptable standard. But it also knows that hesitancy in a potentially life-threatening situation could prove even more costly. The Nashville tornado was one of scores to occur in the central U.S. from May 6 to May 11, easily the most active tornado days this year as severe weather season comes to a peak (though this week is no slouch). Preliminary data collected by the Iowa Environmental Mesonet shows that the National Weather Service issued warnings for more than 75 percent of those tornadoes, but also put out dozens of other warnings in places that saw none. All told, the data shows that the weather service whiffed on about 65 percent of the warnings it issued during the five-day period, which, unfortunately, means it was a pretty good week for the agency. The National Weather Service concedes that the complexity of tornado forecasting makes it hard to find a clear solution. This has been the case for decades. Forecast verification data from the weather service over the past two decades shows that for all the advances technology has provided to forecasting, the agency has made only a relatively small dent in how often it’s wrong when issuing a tornado warning (from 80 percent in 1989 to 72 percent in 2014). Carbin said a new challenge for NWS is how to handle the massive quantities of data being produced by rapidly advancing technology when staffing levels have remained static or dropped at the agency. Consider this: Forecasters are only a few decades removed from when weather balloons and hand-drawn forecast maps were the foundation of prediction technology. Now there are forecasting computers that can produce trillions of calculations a second, analyze atmospheric data on a three-dimensional plane and produce respectably reliable forecasts up to a week in advance. “It does bring up an interesting question — at what point do we max out what technology can do for us alone?” Carbin said. 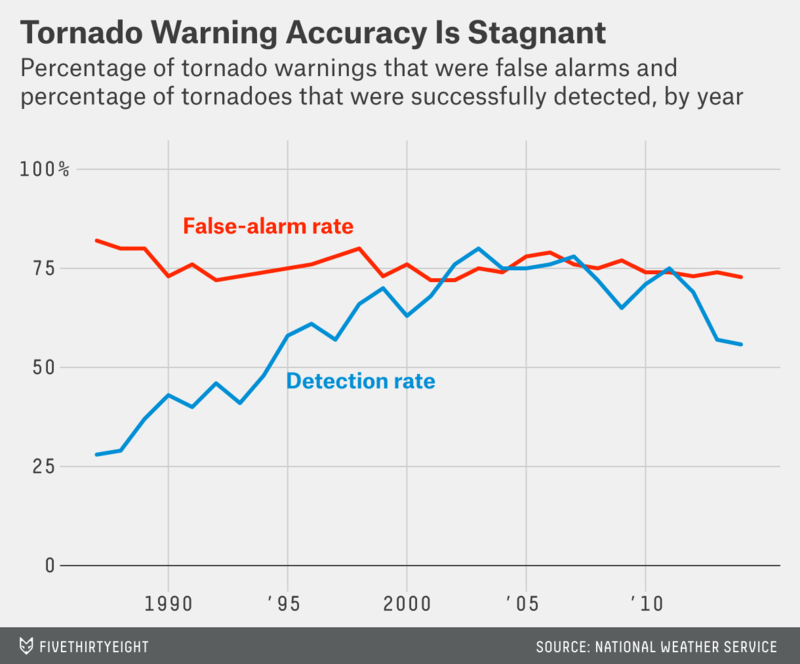 Still, technology has led to significant improvements in accurately predicting tornadoes when they do touch down, just not in avoiding false alarms. According to the grading data, the likelihood that a tornado will be spotted by forecasters and accompanied by a warning has improved from just 30 percent in the 1980s to about 70 percent in the last decade. 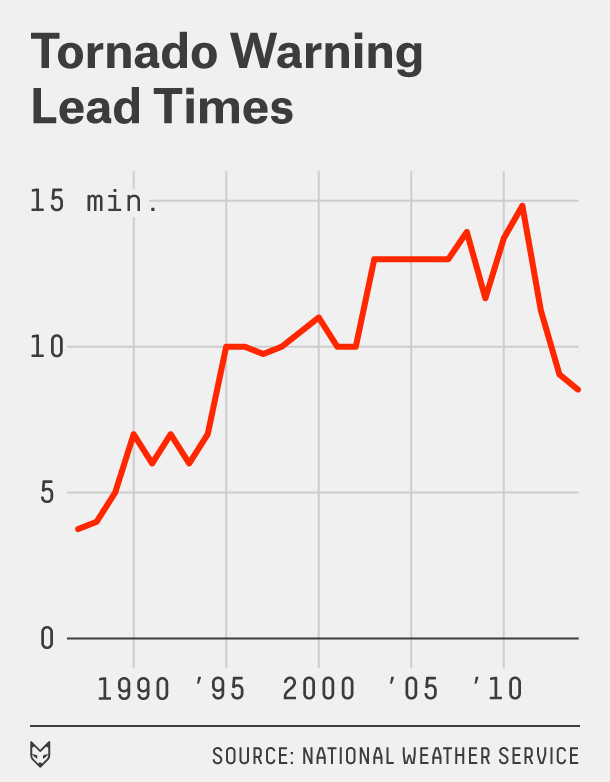 Similarly, the amount of lead time given to the public has grown from just three to four minutes in the ’80s to generally 10 to 15 minutes over the past 10 years, providing crucial time for people to reach safety in a situation where seconds can count. But when it comes to false alarms, the weather service just can’t seem to get the needle moving in the right direction. In 2011 and 2012, the National Weather Service’s office in Mobile, Alabama, one of the most active in the country, had a probability of detection rate above 90 percent and lead times of more than 25 minutes. Its false-alarm rates during those years? Seventy-eight percent and 86 percent, respectively, well above the national average. And the less than optimistic overall statistics come while a booming private industry continues to make marked improvements — enhancements to service they are not shy about sharing. In March, a tornado touched down in Moore, Oklahoma (which was devastated by a massive twister in 2013), but the National Weather Service did not issue a tornado warning until after some of the damage had been done, later stating that a complex forecast made the tornado difficult to initially identify. AccuWeather, which warns private clients of tornado emergencies, put out a warning 15 minutes before the tornado struck. Data also shows that there’s promise in local NWS offices, if not nationally. A sprinkling of offices, such as the one in Wichita, Kansas, have managed to repeatedly keep their false-alarm rates below 60 percent, while maintaining probability of detection rates near or above the national average. But the success of the National Weather Service’s best-performing offices hasn’t been replicated nationwide. There’s also hope that the implementation of dual-polarization radar — which analyzes atmospheric objects on both horizontal and vertical planes — will help the weather service shake the stagnant false-alarm record loose, but its impacts remain to be seen. The new technology was installed at all 160 weather service offices in 2013, but has yet to bear significant fruit. For now, though, the hunt for a signal in the noise continues at the National Weather Service. In 2008, the National Weather Service began using more refined tornado warnings that focus on just the areas where there is an imminent threat. Before that, tornado warnings were issued at a countywide level.